For those with a loved one’s birthday fast approaching, we’ve come up with the perfect gift for those who are staring down the barrel of *insert date here* and wondering what could be the best way to show their parent/partner/offspring/sibling/neighbour/teacher/favourite mechanic/etc a physical manifestation of their appreciation. A garden care gift voucher from The Garden Fairies! Our gift vouchers can be customised according to the number of hours/fairies you require – just visit our Fairy Fees page to determine which garden care package best suits your budget, and contact us to arrange the voucher. Easy! 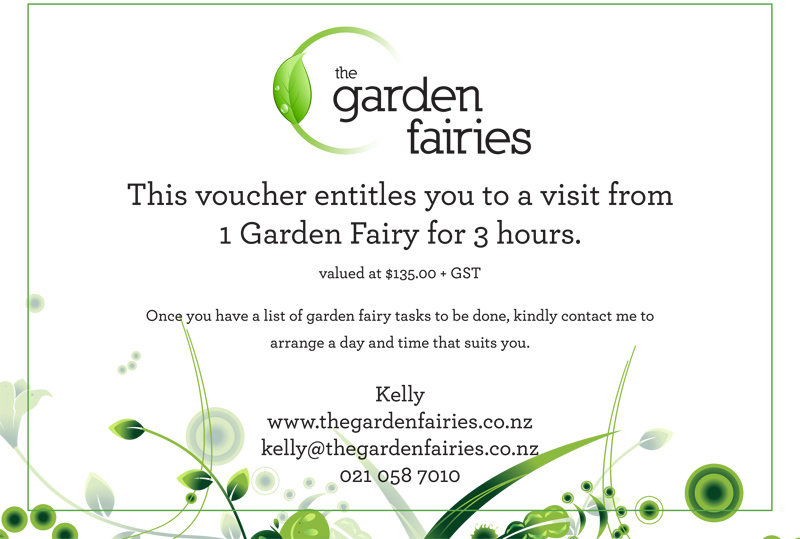 Please note: The Garden Fairies gift vouchers are only available for gardens located in Auckland, New Zealand. Unfortunately, our wings are not strong enough to fly us beyond this area. A travel surcharge will also apply to gardens beyond 15km of The Garden Fairies’ Hobsonville headquarters. Please see the Fairy Fees page for further details, including our price list.